“You can`t be that much overworked do not have time to make money”. We can offer you an excellent chance to make money with us. The foundation of this is IBBestimator application. There is no magic. How it works? We have decided that 6% of our profit instead of being spend for the commercial adverts etc. will be spend on companies and these people who promote us. “Earn with us” IBBestimator program is a typical networking partner`s program, where when you recommend us to a further customer – we pay you an excellent money from their purchases as a commission. To register to the “Earn with us” program you need to be simply an IBBestimator registered user! Download IBBestimator mobile application and register. Once you have accepted the Terms&Conditions you will be allowed to recommend us to 10 persons or companies who will build next 100 group of people or companies and then next 1000 group of people or companies and make profit from their purchases (see rows of Table below). In your concern is that: – found by you people or companies are also registered as IBBestimator users. – they present your unique login while they register themselves and others to allow system to recognise your group. From that very moment all purchases done by these persons or companies will be incorporated in to your account and will give you a permission to get commission. This should be easy for you to achieve because over 5000 products we sell at the lowest prices in UK market and we take special care for prices for PRO version of IBBestimator users. Possibility of brilliant earnings rises because the program allows the commission to be collected from three levels of people or companies according to numerous-level marketing. The group, from which purchases you can earn the income is 1110 maximum (people and companies), i.e. 1000 on the third level (see pyramid). Do not afraid this (as other financial pyramids) – in our program we are only one who pay! The table below shows you the possibility to earn superb money assuming that whole group (full 3 levels) has been build up. 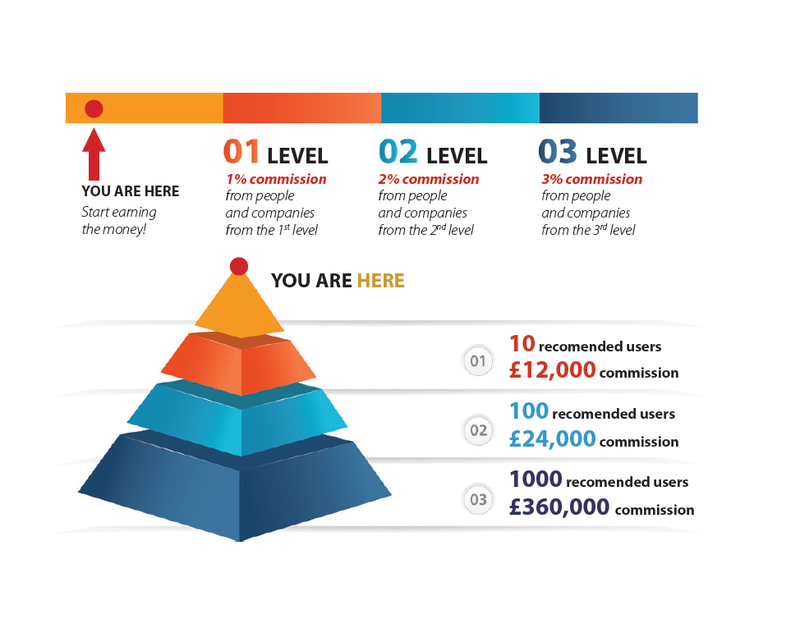 In conclusion, the first condition needs your full commitment as you will need to find the 3 levels of buyers, the second condition is that every each registered on-line IBB or IBBestimator App user will do the shopping for £1000 per month. Purchase for £1000 per month can be the average order even for small builders. It goes without saying, that building the group with less number of people and companies but who buy more and buy higher value products gives you an excellent income worth commitment. Created by us on-line accounting system and evidence of every each transaction on the server make that summary of each client`s purchases (who will give us his login while purchasing) are linked to precise people/companies in specified groups. The on-line mechanisms allow every one IBBestimator App user in real time 24/7 to monitor his own profit, profits of whole his group and the amount of his commission due. This program could be in addition an amusing game!